Last night, Be Reasonable campaigners held a demonstration in Llanelli as First Minister Carwyn Jones visited the town. 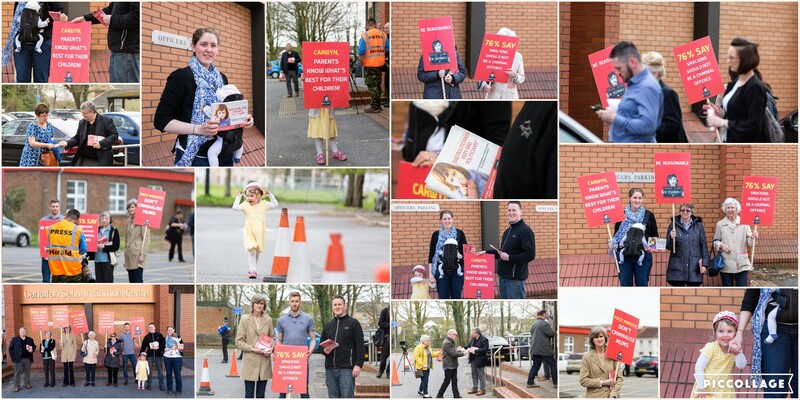 Volunteers held placards challenging the smacking ban and handed out literature on why it is such a dangerous idea. From the outset, the level of public opposition to a ban was evident, with people approaching the group to say they agreed with us. This feeling spilled over into a special ‘Connect with Carwyn’ event as several people pressured the First Minister on the Government’s plans. Despite the event being geared towards local topics, almost a third of the evening was spent on the smacking issue. Throughout this time, there wasn’t a single voice of support for a ban. Mr Jones was asked why he’s ignoring the public. According to ComRes polling, a staggering 77 per cent of adults in Wales think it should be up to parents to decide whether or not they smack their children. The First Minister claimed that he hadn’t seen the poll and was acting on a manifesto pledge. His closemindedness on the issue was further demonstrated as he admitted that a recent consultation on the Government’s plans “wasn’t an open consultation” – it was “not on whether to but how to”. It’s clear that the Government is pressing ahead with its plans despite an outcry from the public, and without having ever asked our opinion on the matter. He claimed that in countries that have implemented a smacking ban, “it hasn’t led to a plethora of prosecutions of parents”. Clearly he hasn’t seen (or refuses to see) what’s happened in New Zealand. Earlier this year, top law firm Chen Palmer found that outlawing smacking has criminalised ordinary parents and led to loving families being ripped apart. Chen palmer says the New Zealand legislation is ‘confusing’ and points to a lack of clear guidance for the police. What makes the First Minister so confident his Government won’t make the same mistakes? He seemed to be recognising what most of the public do. Namely, that most of us were smacked, that many of us do smack, and that it doesn’t do anyone any harm. Given all this, and given that the law as it stands protects children, what is the point of this ban? Surely it’s just the governing elite forcing their parenting preferences on the whole of Wales. In our view, that’s just not on. The event in Llanelli last night demonstrated the breadth of opposition to the Government’s plans. We hope that the First Minister will sit up and take notice.